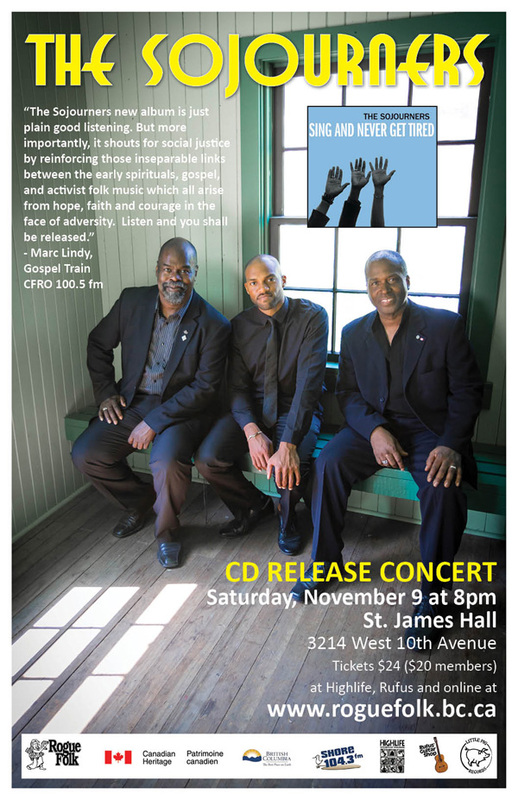 November 9th: The Sojourners Official CD Release Party in Vancouver at the St. James Hall for the new CD Sing and Never Get Tired. See the poster here. September 15th:The Sojourners released their latest CD Sing and Never Get Tired on the Little Pig Records label, produced by Paul Pigat. October 6th to 27th: The Sojourners complete a 10 city tour of Western Canada. May 12th: Jim Brynes, The Sojourners and C.R. Avery appear at the Rogue Folk Club Silver Jubilee Concert in Vancouver, BC. June 30th: Western Canadian Music Awards ceremony features a show-stopping live performance by The Sojourners, Jim Byrnes and Steve Dawson. February 2nd: The Sojourners are nominated for a Juno Award - Blues Album of the Year for their eponymous sophmore release The Sojourners. October 22nd to 31st: The Sojourners tour the Netherlands with Jim Byrnes. September 21st: Black Hen Music releases a DVD documenting the performances of The Sojourners, Jim Byrnes, Steve Dawson and many others as part of the All Star Tribute to the Music of the Mississippi Sheiks at the Capilano Theatre. It will be released in Canada, the United States and Europe. 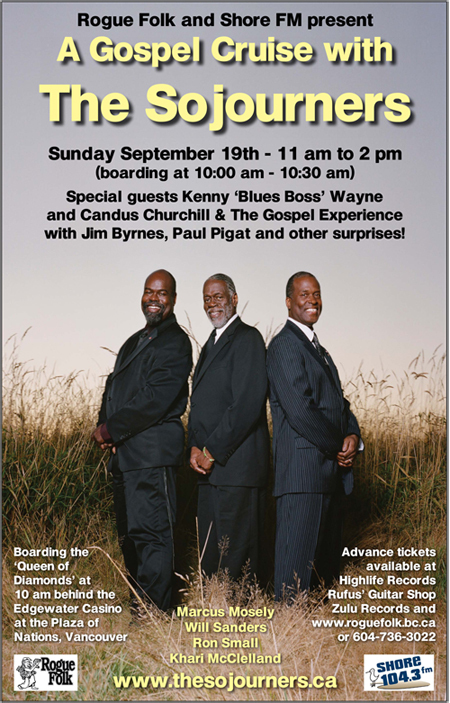 September 19th: The Sojourners cast off on a Gospel Cruise in Vancouver with special guests Kenny 'Blues Boss' Wayne and Candus Churchill & The Gospel Experience. Jim Byrnes and Paul Pigat will be aboard too, along with other surprises. See a poster here. July 9th - 11th: The Sojourners appear at The Winnipeg Folk Festival as part of a Tribute to the Music of the Mississippi Sheiks. May 12th: The Sojourners appear as one of 14 musicians and singers at the Capilano University Theatre in North Vancouver as part of an All Star Tribute to the Music of the Mississippi Sheiks. March 19th to 27th: The Sojourners tour Germany and Belgium with Jim Byrnes. January 19th: The Sojourners second album The Sojourners was released on Black Hen Music. April 24th: The Sojourners will appear in Ottawa as part of the National Arts Centre’s BC Scene, the largest-ever gathering of BC artists outside the province. For more information please visit www.bcscene.ca. January 27th: Let Freedom Sing, a Time-Life 3CD on the music of the Civil Rights era is released. It includes a track called Eyes on the Prize by The Sojourners. Buy it here at Barnes & Noble. October 30th: The Sojourners have been nominated for a MapleBlues Award in the New Artist/Group category. VOTE for the Sojourners at www.mapleblues.ca before December 6th. October 30th: The Sojourners have been selected to appear at the MapleBlues Awards ceremony on January 19th in Toronto. October 9th: The Sojourners have been nominated for a Canadian Folk Music Award in the Vocal Group of the Year category. September 15: The Sojourners will be performing at the Western Canadian Music Awards festival in Edmonton on October 18th at The Artery. They have also been selected to perform on the WCMA show on October 19th. September 1: ‘Eyes on the Prize’, a track from The Sojourners' Black Hen CD ‘Hold On’ has been selected for inclusion in an upcoming Time-Life compilation on the Civil Rights era. July 31: The Sojourners were nominated for WCMA Roots Album of the Year – Group. October 18: Jim Brynes' House of Refuge CD featuring The Sojourners picks up the Western Canadian Music Awards trophy for Outstanding Blues Recording.